The Invoke XBRL Suite acts like a pair of glasses making it possible to render any XBRL document in a readable form regardless of the user profile. Able to be used in both reader or writer mode, the Invoke tools present XBRL data in a user friendly manner in digital forms based on the Invoke XBRL spreadsheet application. The pair of glasses making it possible to present XBRL data in a human readable format. Enjoy the instant web publication of dynamically resized reports (XBRL typed dimensions supported) showing multi-entity, multi-period and multitaxonomy analyses. The missing link between a report and an XBRL instance document. Input XBRL data within the user-friendly web spreadsheet environment and benefit from the dynamic data entry features such as adding as many records as needed in an XBRL instance using typed-dimensions. Design web forms and report templates from any XBRL taxonomy. Build dynamic XBRL data entry or rendering web interfaces with just a few mouse clicks, on the basis of any taxonomy. The possibilities are infinite! The high-performance XBRL validation engine. Provide real time validation of XBRL data either by triggering an on demand anomaly report or by directly highlighting the cells in error within the spreadsheet. Response times are just amazing! 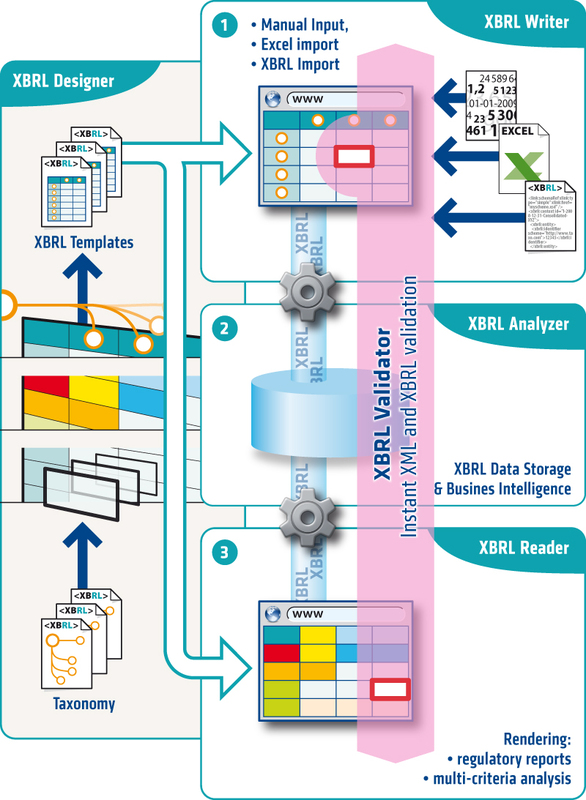 Harness the analytical power of XBRL! Leverage new generation generic XBRL storage systems to extract business-relevant information from mass volumes of XBRL data. The INVOKE XBRL suite acts like a pair of glasses making it possible to render any XBRL document in a readable form regardless of the user profile. Able to be used in both reader or writer mode, the INVOKE tools present XBRL data in a user friendly manner in digital forms based on the INVOKE XBRL spreadsheet application. Why Invoke is the partner of choice for XBRL technology?